It's a shame you missed this film in theaters (almost everyone did) because its visuals just won't have the same magical oomph on the small screen. But this is an extraordinary adaptation and will be considered a classic in the future, so don't miss out. In an era of severely dumbed-down children's movies, the first live-action "Peter Pan" picture since the silent era does something extraordinary -- it un-Disneyfies the story, revives the deeper themes of J.M. Barrie's original book and play, and emerges as an appropriately wily family-fare delight. From its exquisite, Maxfield-Parish-inspired Neverland of golden sunlight, lush green forests and cotton-candy clouds to the quintessently pubescent and enigmatically tingly chemistry between Peter (the strangely pretty 14-year-old Jeremy Sumpter) and Wendy (the even prettier 13-year-old Rachel Hurd-Wood), the film is a vivid and surprisingly visceral experience. Director P.J. Hogan ("My Best Friend's Wedding") evokes the true wonder of childhood in the eyes of his young stars as Peter Pan, the mythical leafy-clad boy who refused to grow up, hovers with the power of happy thoughts and fairy dust outside the third-story window of Wendy Darling on a snowy night in 1900s London, engrossed in the stories of adventure that the girl spins with wide-eyed zeal for her little bothers John and Michael. Caught in the house while chasing his runaway shadow (one of Barrie's most ingenious touches of imagination), Peter is befriended by the girl, who sews his shadow back on. He then whisks her away from her encroaching passage out of adolescence (with her little brothers in tow), through the skies and into a his distant fantasy land of fierce pirates, ominously alluring mermaids, jealous fairies and the Lost Boys, Peter's companion band of young grubs who inhabit the woodlands of Neverland and long for Wendy to play mother to them. But there's more going on here than just a fairytale. The film also embraces Barrie's intended subtexts of emerging sexuality clashing with immaturity ("You can't catch me and make me a man!" Peter declares mischievously but intently to Wendy), the traditional roles men and women take on in relationships, and the sacrifices one makes when one grows up. Before the Darling children disappear from their home, begetting their mother's nightly vigil at the bedroom window, she tells them of their exceedingly proper father's real-life form of bravery in setting aside his dreams to become a breadwinner and good parent, even though that meant becoming obsequious to an overbearing boss. As is tradition in proper "Peter Pan" productions, the role of the father and the role of Peter's arch nemesis Captain Hook, are played by the same actor -- both characters being juvenile point-of-view symbols of adulthood, one a terrifying metaphorical prospect, the other practical and dull. In this film Jason Isaacs (the malevolent Malfoy in the "Harry Potter" movies) is brilliant in both parts, amusingly prim and uptight as Mr. Darling and deliciously, seethingly sinister -- yet almost piteously forlorn -- as Hook. Sumpter and Hurd-Wood are magical and effervescent as Peter and Wendy, popping with playful enthusiasm and yet portraying a lot of emotional nuance as they're drawn to each other in ways they're too young to understand. And in another stroke of inspired and unexpected casting, this movie's particularly Puckish Tinker Bell, the pretty little fairy who whispers in Peter's ear and develops a green-eyed spitefulness toward Wendy, is played by sultry French starlet Ludivine Sagnier with a hyperactive, voiceless vivacity that recalls the busy body language of the best silent film comediennes. "Peter Pan" suffers from annoyingly abbreviated plot advancement much of the time, and it has many other nagging little shortcomings. Sumpter and Isaacs make Pan's encounters with Hook something to relish, but their swordplay is almost incomprehensibly over-edited. Despite a storybook-like narration that even gets us inside Tinker Bell's mischievous psyche (fairies are so small they have room for only one feeling at a time), there are points at which the film doesn't explain itself very well -- as when Peter observes a loving family moment through the Darlings' window and we're told, "He was looking at the one joy from which he's forever barred." Oh yeah? Why's that? 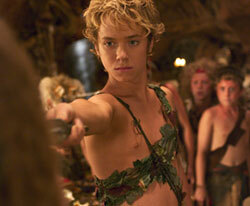 But despite many nit-picks, watching this movie, I felt as if I was discovering "Peter Pan" all over again. Hogan's faithfulness to Barrie's spirit -- from the deliberately self-aware flying effects that hark of a stage production to the emotional gravity of fading memories from home that snap Wendy out of her Neverland seduction -- gives this movie the makings of a potential children's classic.